Like we said last week in the first installment of this column, there is no shortage of blight to point out in this city. And yes, for those of you who e-mailed and called and stopped by, we will get to all of your suggestions in the coming weeks. But first, we focused our lens on a house at 2607-09 Whalen. 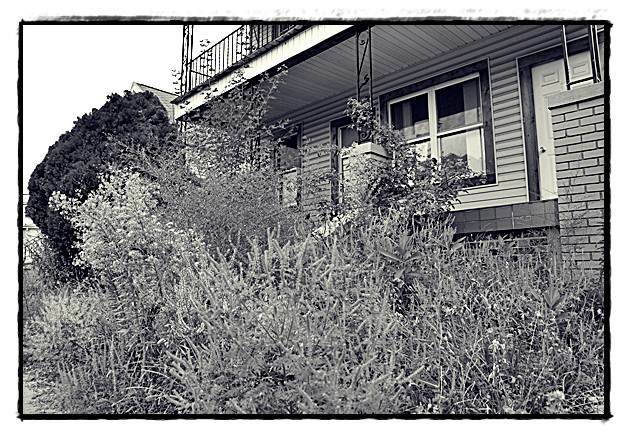 While it’s certainly not the worst property in Hamtramck, and in fact the house is still in decent shape, it is more than an eyesore for Camille Stock. 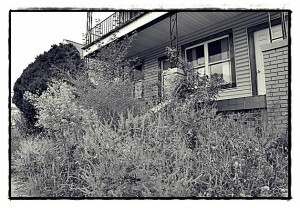 The house has been in foreclosure for about two years, and the property manager has failed to maintain the lawn. The grass has turned into weeds, and the weeds are now about waist high. Compared to the many neatly manicured yards on the street, this house stands out like an ugly wart. In the back of the house, a vine from next-door is threatening to take over the whole yard. It’s not only bad to look at, it’s also causing breathing problems for Camille. She has asthma and pulmonary disease. She needs the aid of an oxygen tank to breathe properly. What makes it worse for her is the extra load of pollen coming from the yard. She has pleaded and begged with folks in City Hall to do something about the yard, and even saw a city code inspector a couple of weeks ago checking out the property. “But nothing gets done,” said Camille. Oh, did we mention that Camille’s husband is a retired Hamtramck detective? Not that that has anything to do with anything, other than he’s 90-something years old, and wouldn’t it be nice if this elderly couple could live out their golden years without having to worry about the property next-door? But it’s also not just about their health. Camille has a new worry now that the new school year is about to start. Doesn’t that about make you want to choke up? Here she is, in her 80s, and she’s worried more about kids than her own health and well-being. Now, if only someone in City Hall had an ounce of Camille’s empathy. Or, since City Hall apparently has deaf ears, maybe there is an old-fashioned Good Samaritan out there who could give the property a quick weed-whacking and clean-up. And now, for a follow-up about last week’s column. Someone cleaned up most of the furniture scraps in the alley behind Paycheck’s Lounge, but not quite all of it. As of Wednesday, there were a couch and mattress still sitting there.